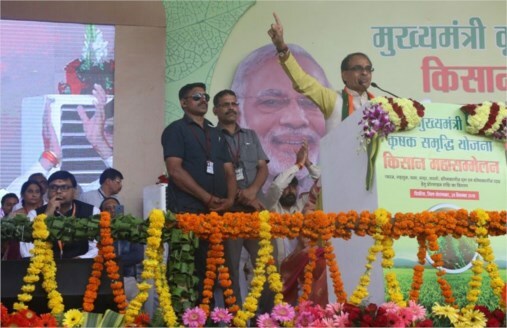 Chief Minister Shivraj Singh Chouhan said that new techniques will be used to cut down agriculture cost. Organic and unique farming will be encouraged. The Chief Minister was addressing the Kisan Maha-Sammelan in Pipariya of Hoshangabad district. He transferred an incentive amount of Rs. 853 crores in the bank accounts of 9 lakh 48 thousand farmers through RTGS under the Mukhya Mantri Krishak Samraddhi Yojana on the occasion. Under the Mukhya Mantri Krishak Samraddhi Yojana, incentive amount of Rs. 4 crores 88 lakh was transferred in the bank accounts of 14 thousand 573 gram producing farmers. Similarly, Rs. 374 lakh in the bank accounts of 187 masoor producing farmers, Rs. 181 lakh in the bank accounts of 93 mustard producing farmers and Rs. 57 crore 7 lakh in the bank accounts of 26 thousand 501 moong producing farmers were transferred towards the incentive amount. CM Chouhan gave loan sanction letters of Rs. 24 lakhs to beneficiaries Mayur Dabar to start a digital laundry and Rs. 7 lakhs to Neeraj Sahu for Handloom Shop under the Mukhya Mantri Udhmi Yojana. Similarly, under the Mukhya Mantri Krishak Samraddhi Yojana CM Chouhan gave an incentive amount of Rs. One lakh 600, Rs. 75 thousand and Rs. 60 thousand in the symbolic form to farmers Shri Man Singh Gurjar, Shri Khushilal and Shri Ashok respectively. Under the Sambal Yojana, he provided financial assistance of Rs. 4 lakh and Rs. 2 lakhs in the form of ex-gratia to Hemraj and Gullu respectively. He also distributed the assistance amount and certificates in the symbolic form to the beneficiaries of Handicapped Pension scheme and Saral Bijli Bill Maafi Yojana. Chief Minister Chouhan dedicated and performed bhoomi poojan of 20 works costing Rs. 27 crores 89 lakh in Pipariya. This include dedication of 5 works costing Rs. 8 crores 24 lakh and bhoomi poojan of 15 works worth Rs. 19 crore 65 lakh.